Syria’s foreign ministry has accused Turkey of providing “logistical and fire support” that empowered “terrorist groups” to capture the Syrian city of Idlib and the strategic town of Jisr al-Shughour. 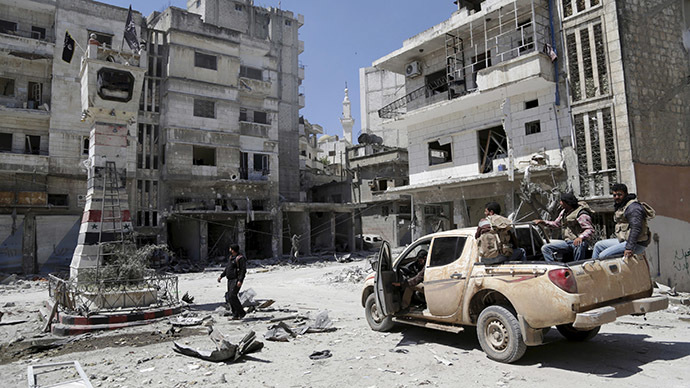 Last month’s capture of the border city of Idlib and last week’s surrender of Jisr al-Shughour, both located in the northwestern Syria, have only fueled the suffering of the government forces. On Monday, Islamist fighters advanced to the port city of Latakia, a stronghold of President Bashar Assad, by capturing an army base. In the fall of Idlib, “the main factor was the huge support that came through Turkey; logistical support, and military support, and of course financial support that came through Saudi Arabia and Qatar,” said Assad in an April interview with Swedish newspaper Expressen. The ongoing Syrian accusations – that during times of civil war, Turkey promotes opposition fighters, as well as letting thousands of foreign jihadi fighters through its border – have been rejected by Ankara. Syrian expatriates all over the world have lately united to condemn the “flagrant Turkish aggression on the Syrian territories,” expressing their solidarity with the homeland in various statements, the Syrian SANA news agency reported. The National Union of Syrian Students, Cuba Branch, and the Syrian community in Cuba also called on the United Nations to hold the Turkish government, as well as others backing terrorism states, accountable. Since the Syrian Civil War broke out, over 220,000 Syrians have been killed and 1.5 million have been injured, according to recent UN estimates. The conflict was started when anti-government demonstrations escalated into rebels fighting against the regime. While according to President Assad, government forces are fighting back terrorists, some activists believe that he suppresses opposition.